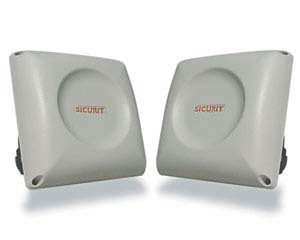 Compact microwave barriers with range up to 80 mt. Range : 50 - 80 mt. High tech outodoor microwaves with planar antenna, consists of transmitter and receiver to protect up to 50 mt. or 80 mt. The receiver incorporaters signal processing with wider dynamic range, enhanced target analysis and minimum susceptibility to interference. They offer volumetric protection able to detect any intrusion attempt. Easy to install, MES series can be mounted on poles or directly on walls with the optional brackets. Its small dimensions enable descrete and wide range of applications. Can be used in small and medium range perimeter lenghts for the protection of long windows, wide industrial doors, medium size areas and residential areas, long corridors, balconies and gates. installation with his optional wall brackets or pole brackets.